My blocking experience and training started back in 1979. My job description was a “Blocker”, I blocked hundreds of canvases my first year. No exaggeration! We were the finisher for many needlepoint shops and numerous churches along the East Coast. This is where I had the opportunity to learn and recognize the individual characteristics of needlepoint canvases, threads and stitching techniques. The individual’s tension and approach to stitching influences the behavior of a stitched canvas. These are my perspectives on a few of the materials and techniques. Keep in mind that church work is my passion and I am all about durability, longevity and preserving needlepoint heirlooms. I also want to get the full stretch out of the canvas so it will hold its shape and not move/stretch or warped over a short period of time without the use of stablizers. Penelope – Great canvas for an item that is decorative because of the detail you can get in the design. Is a delicate canvas and not meant to withstand a lot of pressure when used as a piece of furnishing such as: church kneelers, cushions and footstools. Bleached/White mono-weave canvas –Depending on the person’s stitching tension and technique this canvas is unpredictable in the amount of stretch that you will get out of it during the blocking process. Unbleached/Tan mono-weave canvas – This is my favorite canvas. It’s durable because it has not been bleached, there is not a lot of give so the amount of stress that you can get out of this canvas is more predictable, even taking stitching techniques into consideration. Interlocking – Not recommended for church furnishings, footstools, chair coverings & rugs. This is a weak canvas and will not withstand the pressure of use. This is not a forgiving canvas during the blocking process and if you are not careful the canvas threads will break, very easily. Blocking is the foundation for a nicely finished piece. If the blocking is not done properly the finished piece will not hold its shape during the finishing process. The threads of an unworked canvas are square and they become askew during the stitching process, so our goal during the blocking process is to stretch the canvas to it’s full potential and to get the canvas back into a square position. 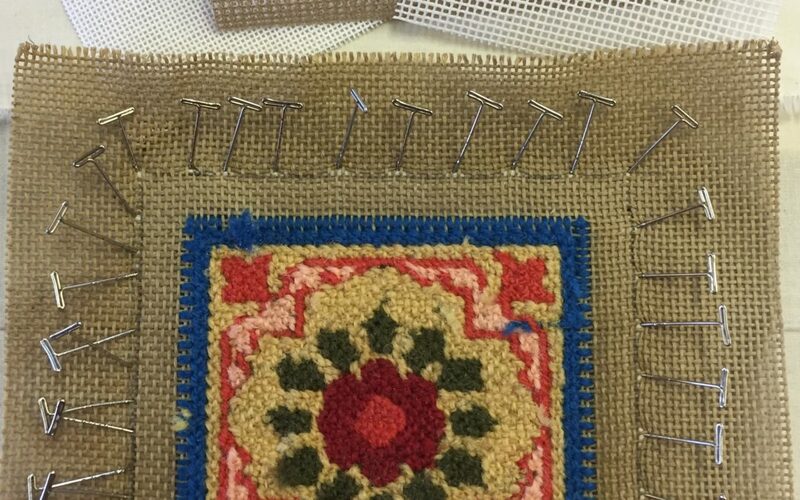 The shape of the stitched area doesn’t matter, whether it’s a round design, rectangle or an obscure shape, you still want the stitching to be perpendicular. If you get the full stretch out of a canvas no glue or stabilizer will be necessary for the canvas to keep its shape. My professional tip: If your canvas has a selvage edge (a manufactured edge that prevents the canvas from unraveling), snip into it at ½ inch intervals. This relaxes the tension from the selvage and will allow your canvas to stretch more in this direction.